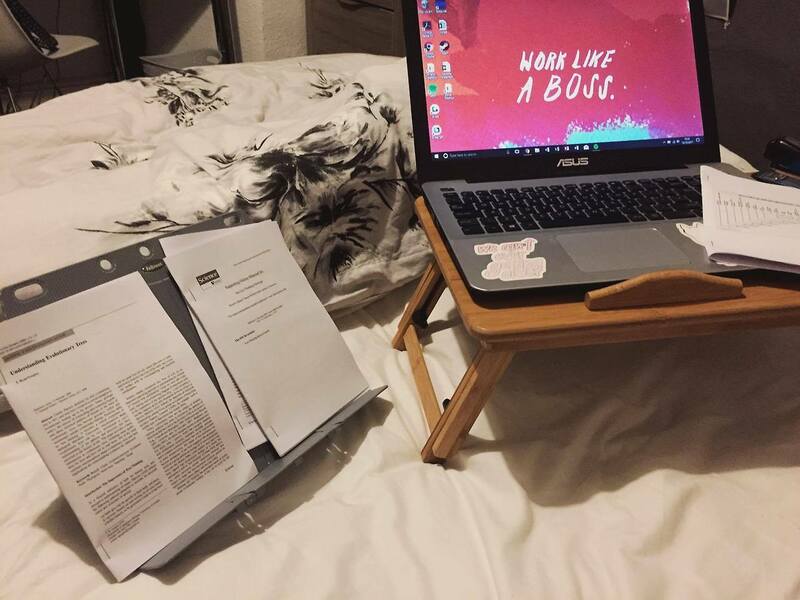 Studying is hard, there’s no denying it, and even the most motivated workers have to deal with the urge to procrastinate. It always seems that when you need to work the most is when it is hardest to do so; so here are my top tips to deal with procrastination and making yourself productive. Working for long periods of time is ineffective, just as much as taking too many breaks is, as well. Productive people have good time management, and that starts with looking at what needs to be done and when. Prioritise your tasks based on when they need doing and how long it will take to do. Tasks which take the shortest amount of time and are due first should be done first, and the tasks which take longer to complete and are due later can be done last. Once you have your order established, then comes the work itself. There are a few methods I use to make sure I don’t drain myself, but they are both loosely based on the Pomodoro technique. The Pomodoro technique states that the best way to work is in intervals of twenty-five minutes with five-minute breaks after every burst of study. To keep this slightly more interesting for myself, I incorporate music into it. The Vinyl technique; vinyl records don’t have a long play time. Each side tends to be around 20 minutes long so you study whilst the record is playing, and when it reaches the end of the record, have a small break, then flip of the record and study again for another twenty minutes. Non-repeating playlists; create a playlist of background music (pop and other sing-a-long/upbeat genres are often distracting) that lasts between 20-30 minutes. Instead of setting the playlist to repeat, turn off that option and have it end instead. The end of the music will be the break indication and then you can have your short break and return to work. Forest – you grow trees when you don’t use your phone, which generates in-app coins that can be used to purchase real trees for people in third-world countries. Quizlet – allows you to create online flashcards or use ones created by others. Wolfram Alpha – an online scientific calculator and a scientific bank of knowledge and support. I used this loads during my A-Level Chemistry to help balance chemical equations. Khan Academy – a great resource for helping you recap and understand information you’ve been taught in class. Focus Keeper – a Pomodoro tracker that is easy to use and set up. Headspace – a relaxing, meditation guide that helps destress you and keep you on track. Having a planner is incredibly important for being productive. It allows you to keep a record of everything that is due and having that visually in front of you makes you more task focused. Being able to cross off completed tasks also gives you a massive boost, as it shows what you’ve done and how much you’ve done. Creating a bullet journals is also a great creative outlet when you’re taking breaks in between work and it also allows you to track other habits such as exercise, money saving, and water intake. Once you get into the swing of studying, it can sometimes be hard to stop. What makes it harder is when you know you have tests and deadlines looming, but staying up all night or reaching the point where you’re physically and mentally drained is inefficient. You have to know when to stop and rest. If you know a certain bit of work has to be done as soon as possible and there’s not long left, reaching the point where you’re losing focus and making mistakes because you’re tired is not going to help. Take a longer break, cook yourself some food, have a nap for an hour or two, talk to friends or family, and let your body and mind recharge. You’ll produce much better work when you’re well rested and have a full stomach. Remember that your physical and mental health takes priority over any work you’re doing. Nothing is worth damaging yourself over, so make sure you allow your mind and body healing time. Eat healthy, drink plenty, exercise, and make sure you talk. Have conversations with people, be it friends, family, or teachers. Get things off your chest because letting things build up will never end well. Venting is healthy and being healthy in mind and body is more important than any piece of homework.